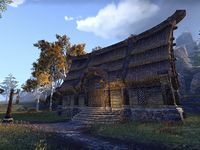 The Lake-Heart House is a house on the northern outskirts of Riften. 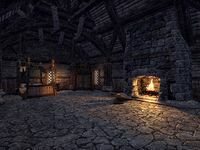 It is a one-room Nord-style building located in front of the Riften Outlaws Refuge entrance. A cooking fire is situated right across from the entrance. A food pot can be found near it. The area on the right-hand side is furnished with a table, a wine rack, and a desk. A letter found on the table explains why the interior of the house is so bare. The left-hand side of the house is occupied by a bed, a wardrobe, and a nightstand. All the storage containers here are owned.